The Kpop Jungle: BAP Sings About Their "1004(Angel)"
BAP Sings About Their "1004(Angel)"
When you get used to a group having more than multiple comebacks within a year, it feels as if they've been gone forever even if it's only been 6 months since the last comeback. I am more than happy to have the boys of BAP back again, and I was also excited for them to redeem themselves after the mess that was Badman. I can usually handle a less than stellar title song from my favorite groups (I stan SM groups, so I'm used to it) but there was a lot more that felt lacking about that particular comeback. It could have been so amazing, I mean it had all the right conditions; a video shot on the US, an interesting concept and great styling, but it just fell flat. So you can imagine my joy when I heard the teasers for 1004(Angel). Not to say the group haven't been busy during their hiatus, in fact they've had lots of work to do; in Japan specifically. Both Japanese versions of Warrior and One Shot were released, and on top of that has leader (and my bias) Bang Yongguk been spending a great amount of time in the studio, working on their first album. Right off the batch I can say I love the song, and I loved it instantly when I first heard it. But the video on the other hand, is not quite as excellent. It's a very sad song, the lyrics tell us a story of loosing a loved one and not being able to function without them. They constantly refer to their lover as an angel, hence the title. The video contains six different plots, one for each member, where they all try to handle the breakup in various ways. Yongguk is running through the desert and is seen digging deep into the ground trying, Jongup faces a huge wall made of stone, and he tries to break it but he is unsuccessful. Daehyun and Himchan share the same set, a room filled with items that remind them of their past girlfriend(s), and Youngjae is stuck in a room full of mirrors. Maknae Zelo visits a amusement park and a merry-go-round that he and his girlfriend used to go on. It seems some of the plots are involved with each other in some ways, like Daehyun's and Himchan's shared set as well as an item that both Yongguk and Daehyun possess. The other members seem to have no connection with each other and that seems a bit strange to me. I would have liked it if there was something that brought them all together, something that they all had in common, but now it seems only a few of them do? Anyway, the plots of each member were pretty clear and self-explanatory. Yongguk is digging a whole through the ground, frantically searching for something. 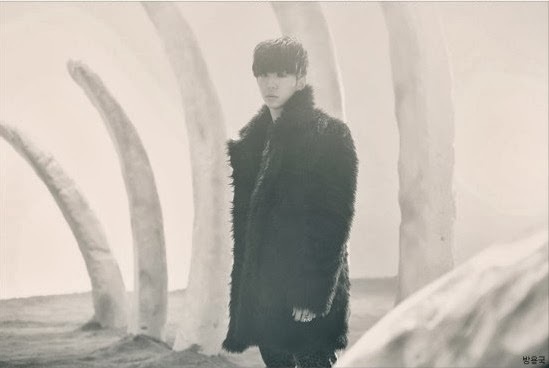 He is in some kind of desert, completely abondoned with nothing else in sight but some gigantic bones sticking out of the ground, very similar to those in B1A4's video for Tried to Walk. I appreciate the simplicity of his story, because it's not very complicated nor does it involve him doing much else besides digging, but that's the beauty of it. You can understand exactly what he's doing and how he feels. There's something about their relationship buried deep under the surface, and he's desperate to find that one thing, to feel connected to his girlfriend that is no longer with him. I feel like Yongguk's scene fit the theme of the video the most, because it had an effect and made sense without feeling too over the top. It was quite beautifully done actually, and felt very realistic (if you look at it from a symbolic standpoint). There's not much to say about Jongup, because he doesn't actually do much besides banging on the stone wall. He hits it and wants it so badly to break, wanting to cross over to the other side, but she is stopping him (the cracked angel wings on the wall represents this). He wants to move on the image of her hinders him. Youngjae is playing hide and seek in a room full of mirrors, constantly seeing his girlfriend in the reflection but never being able to catch her. He sees her face and places his hand on hers, but he can't physically touch her or be with her. Daehyun is pretty much just walking through the room, looking at different items who all have a special meaning to him, and probably to their relationship. He thinks about her whenever he sees all the things that remind him of her. Himchan share the same room, but he watches videos of them instead, imagining her next to him as he remembers their happy memories. Zelo is roaming around a closed amusement park, an merry-go-round in particular, and we see images of him and his girlfriend as they used to go there in the past. Then the lights were shining bright and clear, and now it's all dark. He tries to start it again, but it doesn't work. This symbolizes his attempts at moving forward, making the carousel spin again, but it's still broken; he's not ready. In the ending of the video we come to some sort of breaking point; Yongguk finds what he's looking for and collapses with it in his hands, Youngjae breaks the mirror in anger, wanting to destroy the image of his girlfriend that haunts him, and Jongup gets through the wall and sees the light on the other side. Daehyun finally turns the hourglass upside down, symbolizing how he decides to move on at let time pass again, and Himchan shoots the person staring back at him in the mirror, the person that is still clinging on to the past. In my opinion, the plot is fine and understandable but it seems to be a bit too overwhelming at times. All the pretty fake tears, fake blood and gun usage makes it all a bit too extreme in my opinion. There are lots of videos like this and it could be really good if executed well, but this video fails to be convincing. I just don't buy it. For me, this is the sort of video where the main point of the video is not to make the plot the main focus, even if it has a plot. The main focus is rather on the boys, their cries and screams all while looking completely gorgeous. I'm not sure if I make sense, but I guess what I'm trying to say is that the plot is merely a story on the side to follow along with the song, rather than embracing it and enhancing it. It tried to hard to be angsty and depressing by pulling out all thinkable clichés and using them all in one video. It came across a bit unnatural to me, sadly. The colors of the video were heavily muted and there was quite a lit of black and white going on. I don't really understand the fading out from black and white to a yellow tone in some of the dancing scenes, and I also felt like a lot of the scenes were somewhat blurry. Overall, it was very gloomy and subdued and again added to the depressing theme of the video. Also, for such a tragic song there is a great amount of hip thrusting in the choreography. I mean, I'm never the one to not appreciate some good old thrusting, but there is a time and a place for everything. Other than that, BAP rarely disappoint with their dances and this one is no exception. Maknae line do a solo dance number in the beginning, and I know they're both great dancers but it was a bit messy and all over place, anyway it was for me, but I know a lot of other people really liked it. The styling is good and almost everyone looks amazing (is it just me or is Youngjae getting hotter with every comeback?) but it's nothing revolutionary. I could stare at Yongguk for days though, so that's always a good thing, and Himchan has finally found a flattering hairstyle. I'm not loving Daehyun's blonde locks but I can cope, however I do feel bad for Zelo for never getting anything even remotely decent. Am I happy with this comeback? In general, yes, but there are things I would have done differently. It's nowhere near as epic as One Shot or Warrior was, but is a clear step up from Badman. I'm always looking forward to them killing it on stage, and I am sure to have this song on repeat for days, just not the video.